You’re parked in the city. It’s the middle of the night, freezing outside and you have to take an emergency bathroom break. This is a nightmare situation for anyone living in a van. Portable toilets are a relief and something you’ll be glad to have. You’ve done your research and decided a cassette toilet is the way to go we’ve got you covered. We’ve pulled together a list of the top-rated brands of chemical toilets to help you pick which is right for you. While an ordinary bucket toilet will do the job, a portable cassette toilet comes with a multitude of added benefits. The biggest selling point is lack of smell. A chemical reservoir breaks down waste and hides the odor under a drain valve. Chemical toilets are also familiar to use. They have a pump flush that doesn’t require you to separate liquid from solid waste. In the middle of the night, this is a convenient feature that also requires less action on your part. Fortunately, a cassette toilet doesn’t need to be cleaned as frequently as a bucket toilet. The chemical tanks can go more than a week without emptying. This gives you more freedom to travel without having to look for a waste station. How Does A Cassette Toilet Work? A cassette toilet looks and operates much like your home toilet. To set up, you simply pour fresh water into the upper tank. A chemical solution or disinfectant goes into the wastewater tank. Once it’s ready to go there is very little ongoing maintenance that will have to be performed. A pump flush uses fresh water to wash waste down into the chemically treated reservoir. The chemical reservoir breaks down waste to reduces smell. To empty a cassette toilet, the wastewater tank can be removed from the upper section with a lever. It can then be emptied into an RV dump station, marina, or standard toilet. Chemical toilets are going to come with a list of recommended disinfectants to use in the waste water tank. Ultimately, you can get by with a simple mix of water and bio liquid detergent. Waste will be disposed of in liquid form making it an easy and clean task to perform. Afterward, water and ammonia can be swished around the tank in the end to keep it smelling fresh. Purchasing a toilet with a tight seal and emptying it often will do wonders for keeping odors at bay and your vehicle smelling fresh. One of the downsides to owning a cassette toilet is that the liquids could freeze up in winter. You don’t want to have to purchase a bunch of replacement parts each year so knowing how to winterize it is a big deal. Environmentally safe anti-freeze is inexpensive and can be bought at any RV dealer or online. Quick-dissolve toilet papers can be purchased and used with a chemical toilet. However, we recommend using a separate waste basket for toilet paper to help your chemical toilet avoid backups. In the confined space of a van, size matters. A portable toilet should be small enough to fit into a tight space. A toilet with a sturdy lid can also be used as extra seating for a desk or table. This makes appropriate height an important thing to look for. If the toilet will only be brought out for emergencies, choose something short and squat. For dual-purpose seating, a taller chemical toilet might be more comfortable. Consider how long you want to go between finding a dump station. Do you have more than one traveler? 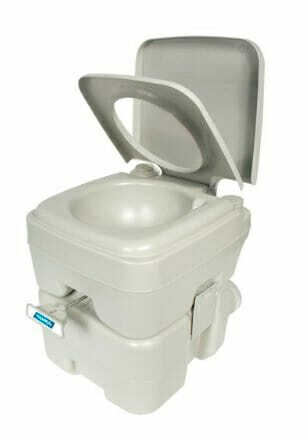 A 5-gallon cassette toilet from SereneLife for example will last about 50 flushes. Having access to dump stations on a frequent basis might lead you to a smaller toilet setup. On the other hand, if you want to be out in the wilderness for long periods of time it might be best to choose something larger. A bigger chemical toilet is going to weigh more than a smaller one. Deliberate the weight of the toilet when full, not the weight of the product itself. A 5-gallon toilet filled with chemicals will weigh up to 40lbs. When it comes time to empty the toilet, it will be necessary to carry that weight and dump it in a dump station. If you are unwilling or unable to lift a toilet that weighs close to 40lbs, opt for a smaller 2.5 or 3-gallon toilet. Some chemical toilets come with a pump flush, and some come with a battery powered flush. It can be difficult to see when a portable toilet is getting full. Some have colored indicators that tell you when it’s time to empty. Lid lock: be sure to choose a toilet with a tight lid lock and gasket between the upper and lower tanks to reduce smell. Emptying spout: to steer clear of the waste during cleaning, be sure to pick a brand that features an easy-to-pour spout. Flush Nozzle: choose a three-way nozzle over single sprout to keep things cleaner. The SerenLife outdoor portable toilet is one of the largest waste water tank on our list at 5.3-gallons. This gives the product roughly 50 flushes in-between cleanings. The exterior measures in at approximately 16.5in tall, 13in wide, and 16in deep. This is a manual flush toilet that does have an indicator when it’s getting full. That means no batteries to upkeep and no guessing overfill. A 3.5-gallon clean water reservoir feeds the piston pump flush. This product is sturdy and closes tight with a double-sealed drain valve. That makes it an ideal portable toilet to use as secondary seating within a van. The wastewater tank has a rotating pour spout that makes the dumping process clean and easy. It’s difficult to find negative reviews on the SerenLife. The piston pump flush is very powerful and will do a great job of washing down waste. If pushed too aggressively there may be some splash back. Thetford is a popular travel brand with two porta potties on our list. The Thetford 260B is the smallest portable toilet on our list with a 2.6-gallon waste water tank. This makes it ideal for someone who does not want to lift a lot of weight or has less space inside their van. The exterior dimensions of the toilet are 14in tall, 13.4 long and 15in wide giving it a much squattier appearance. A manual bellows flush pump means less parts to break and ease of use. It holds 2.6-gallons of clean water and does not require batteries. A single sealed valve keeps the odors low. Because the waste water tank is so small, you can expect about 27 flushes between cleaning. As a con, the product does not come with a waste level indicator. You will have to keep track of this so the bottom tank does not overfill. Finally, there is no carry handle on the waste reservoir. It will have to be kept level during transportation. Luckily, the tank is small so it should not be too difficult to carry. The Camco standard has been around for a long time and is the most reviewed item on our lineup. It has the same size waste water tank as the SereneLife (5.3-gallons) but is slightly shorter and wider measuring in at 15.5in tall, 14in wide, and 16in deep. Many favorable features are present in the Camco. It’s size and sturdiness make it ideal for long trips and extra seating. The bellow pump gives a controlled flush without extra parts. It also has a robust sealed valve to lock in odors. This portable toilet is measureable with the SereneLife but there are a few key differences. No waste water level indicator is present on the Camco Model. There is no rotating pour spout. Because this product lacks a waste level indicator, it will be more difficult to tell when it is full. The pour spout is simply a cap on the end of the reservoir which means you’ll have to be a little more careful when dumping. Similar to what we’ve seen in our refrigerator reviews, Dometic consistently delivers feature packed products. Of course, these benefits come with a price. The Dometic portable toilet is the most expensive in our review. This portable toilet is constructed with ABS and high-density polyetheline so you can sit, stand or climb on it. Besides the great looks, the Dometic 5-gallon portable toilet comes with stainless steel hold downs. This is perfect for driving around and securing the toilet firmly to your vehicle. Handles on both the top and bottom reservoirs make it easy to move around as well. The Dometic toilet comes with a push-button pressurized flush. It will make you feel more at home, but of course comes with more parts and the potential to malfunction. The button flush does need to be occasionally pressurized to work seamlessly. One of the biggest complaints we’ve seen with this toilet is the small seat. Even though the external dimensions fall in the range of other toilets (13.5” x 15.5” x 16.5”) the seat is significantly smaller. Based on the Zimmer comfort portable reviews, this is all-around a good toilet to own. It is reasonably priced and hits most of the boxes checked. Measuring in at 16.5” x 16” x 14.5” it is on the shorter side of toilets with the 5-gallon tank. Combined with the large waste reservoir this makes it a great long-term travel choice. This cassette toilets comes with a bellows flush pump which is one of the best rated we’ve come across. A bellows flush has with minimal parts making it a reliable pump. There is also a sturdy handle built right into the bottom reservoir. As a con, there is no pour spout and no waste level indicator on the bottom tank. This means you will need to do a little guess work when it comes to determining the fill level. Fortunately, instead of a pour spout there is a very large screw cap. This should make it relatively easy to clean out waste. The Thetford Porta Potti Curve has the most unique and appealing design in our lineup. This product is the largest toilet on our list at 18” x 18” x 16” and also has the biggest waste reservoir at 5.5-gallons. Those features make it a good choice for long-haul trips with fewer stops at the dump station. It is the only toilet we’ve reviewed with water level indicators for both the top and bottom water tanks. It also has the unique feature of a toilet paper holder tucked under the bottom. Cleaning the toilet out should be a breeze with the rotating pour spout and sturdy carry handle. The reason the Thetford Curve is not higher up on our list is the battery powered flush. 6 AA batteries come included with the unit but you will want to keep a few extra on hand in case they run out of juice. With no battery power or a damaged pump, there will be no way to flush the toilet. Surprisingly, a replacement electric pump will cost nearly as much as the toilet to repair! From the products we reviewed, the SereneLife Outdoor Portable Toilet has little in the way of cons. In our opinion it beats out the rest because of the reasonable price, large size, waste level indicator and simplicity of cleanup. While other portable toilets are lacking in one area or another, SereneLife checks all of the boxes. We think this makes a great cassette toilet for vanlife.